Heineken Malaysia has just launched a month-long celebration, The Great Brew Fest, that celebrates great quality brews and craftsmanship of Heineken Malaysia's portfolio of premium international beers, stouts and ciders. 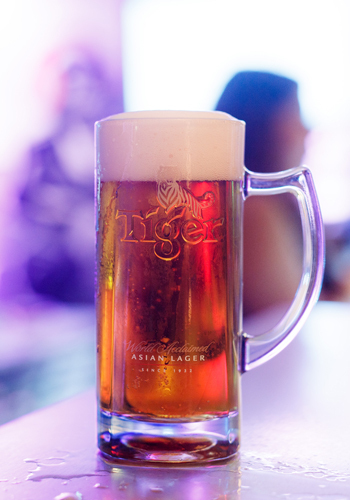 With the celebration comes a new beer called the Tiger Amber Lager, which is crafted and brewed 100% in Malaysia, making it Heineken Malaysia's first ever locally produced amber lager. "This year we decided to add a festival beer, a limited release Tiger Amber Lager to the line-up of our already great brews to bring a higher quality experience to all our consumers," said Roland Bala, the Managing Director of Heineken Malaysia. "There's nothing like having your own locally brewed festival beer to mark the occasion." Along with the new lager, Heineken tapped five local artists to design limited-edition metallic- coloured beer mugs. The artists are CLOAKWORK, Kenji Chai, Beautiful Machines featuring Sling, Jarold Sng and Lynda from Pink Tattoos. Each mug reflects important elements of the beverages – Apple Fox Cider, Tiger Beer, Guinness, Kirin Ichiban and Paulaner München – they represented. To spread more joy and appreciation for the beers, The Great Brew Fest is dispatching a mobile tap bar that will be visiting spots in Kuala Lumpur, Ipoh, Penang and Johor Bahru from 1st October to 10th November 2018. Naturally, as a celebration, there will be promotions and giveaways at participating outlets. Take note that the Tiger Amber Lager and designer mugs are only available at participating outlets during the Great Brew Fest 2018. Click here to see where you can get your hands on them.